This is their bread and butter...right in front of the goalie. Though they were able to eek out a win against the New Jersey Devils on November 26, the mentality of getting shots in front of the net seems to have gone a bit off-kilter. The Penguins have also become a bit lazy when it comes to picking up rebounds for second and third attempts. This is mainly due to the fact that the Penguins are missing their "down and dirty" players who seem to make a home in front of any opposing goalie. It is clear that being without Patric Hornqvist and Chris Kunitz leaves the Penguins without much of an answer in regards to net front presence. They are the kind of players that will plant themselves in front of the goal mouth to deflect or redirect a puck past a net minder. They are the ones going for the rebounds and second (or third) attempts. They will also do some of the dirty work. 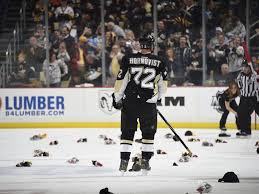 Neither Kunitz nor Hornqvist shy away from banging bodies, chirping opponents, or getting into the scrum along the boards to free up a shot or stick up for one of their star centermen. Head Coach Mike Sullivan has tried many a combination, at even strength and on the power play, but it seems nothing is really gelling together. He has slotted in everyone from Nick Bonino, Matt Cullen, Eric Fehr, and even Conor Sheary in hopes of having some kind of spark in the absence of these character players. On the power play is where their absence is felt the most. Being that "net front presence" is what helps the Penguins power play units be so productive. The booming "one-timer" shots are great if you can get a shooting lane open and someone to screen the goalie at the right moment. More often than not, however, that power play goal is going to come from a rebound off one of those shots. Having someone who is comfortable in front of the net and who is used to looking for those opportunities is what they Penguins are desperately missing at the current time. Before his concussion, Patric Hornqvist lead the team with four power play goals. He also had three assists while on the man advantage as well. Phil Kessel was thriving on the top power play unit but since the loss of Hornqvist, Kessel's points on the power play have gone kaput. Then again, so has the scoring. In the games that Hornqvist has missed, the Penguins have scored only two power play goals. Both of those goals were scored by Captain Sidney Crosby but were teed up by Chris Kunitz, who is also out for an extended period of time. Since Novemeber 19, the Penguins have scored no power play goals. Against the Devils, without both key players, the Penguins went 0-5 on the man advantage and had to go into a shoot out to decide the game. The team is weathering the storm as best they can. In comparison, they are in far better shape than they were this time last season when even their own front office began to wonder if the team would even make it to the end of the season with a winning record, let alone make the playoffs. The Penguins now sit in second place in the division behind the NY Rangers, and are third in the conference (behind the Rangers and Montreal Canadians). Those are not bad spots to be in but the inconsistency of play still lingers and is quite concerning when you have teams like the Capitals and Hurricanes nipping at the blades. Hope is on the horizon though as word came out Saturday November 26, that Hornqvist was back to practicing with the team and taking contact! Another welcome development is that there was full team attendance at the morning practice on November 29 including injured Chris Kunitz who just days before was still listed as week-to-week. It seems the band will be back together once again very soon. There really is no replacing the type of player that Hornqvist and Kunitz are. They play with such passion for the game and with such a drive that when they aren't there, it is felt by the entire team. One move, one goal, one "scrap" from them has the power to ignite the team in ways I have never seen before. Though this could be Kunitz's final season with the team, missing him in the line up is hard enough to deal with. He brings something indescribable to whatever line he plays on. Without him and Hornqvist at the same time can, sometimes, spell trouble. The Penguins were able to keep their head above water during their absence that was thankfully short lived. Hornqvist, at least, is about ready to return to game play which could come as soon as Wednesday, November 30 against the NY Islanders. This is barring any concussion symptoms popping back up however. We're hopeful, depending on how he feels after practice today, that he could play tomorrow (Head Coach Mike Sullivan after November 29 practice). 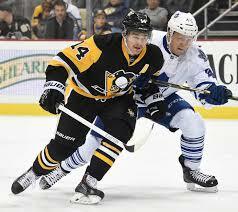 HCMS also made it known that Kunitz would not be back in the line up but that Kunitz was feeling better. As December looms, we are all anxious to see the change in moral that will surely come once one of them (or both) are back on the ice.